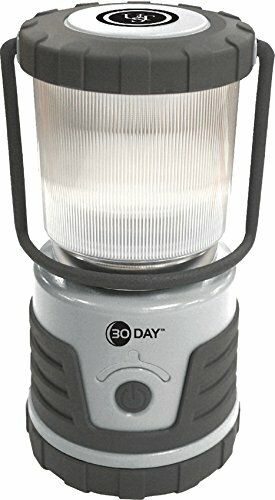 Running for up to 30 days on Low mode, the rugged UST 30-DAY Duro Lantern features an impact and water resistant rubberized plastic housing, an unbreakable lifetime LED, and bright white lighting that's great for camping, hunting, RVs, and more. The 30-DAY Duro's removable globe has an integrated handle, and the lantern base includes a built-in recessed hook for hanging as a downlight. An unbreakable plastic housing protects the three 1.4-watt Nichia white LEDs, and the lantern operates on three D-cell alkaline batteries (not included). The 30-DAY Duro has three flicker-free lighting modes -- High (700 lumens, up to 22 hours), Medium (140 lumens, up to 106 hours), and Low (30 lumens, up to 30 days). It also includes an SOS flashing emergency strobe that lasts for up to 15 days. Compact and lightweight, the 30-DAY Duro measures 7.2 inches tall and 3.75 inches round and it weighs 1.1 pounds with batteries. It's rated to IPX4 for resistance to splashing water, and is backed by a manufacturer's limited lifetime warranty. UST Brands has been manufacturing camping, survival, personal safety, and emergency preparedness equipment for over 80 years, including innovative LED lights, all-weather fire starters, premium outdoor cutting tools, camp kitchen products, first aid kits, unbreakable signal mirrors, and more.